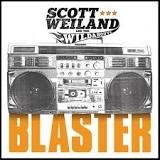 If we’re being honest, the music of Scott Weiland has strangely passed us by. Yeah, we know he was in Stone Temple Pilots and they were huge and we have all heard that glorious song “Slither”, but Velvet Revolver were always in the shadow of Slash’s previous band. Sadly, we know more about his reputation than his music, but this at least meant we approached this new album with a fresh pair of ears. The first track “Modzilla” is the owner of a huge riff which beats anything done by Royal Blood, but that comparison succeeds in strangely meaning it has a very contemporary feel. There is a similar chunky riff on “Hotel Rio”, but this time combined with a more commercial LA rock feel. We get a better indication of the overall sound of the album with “Way She Moves”, which offers a glorious, modern T-Rex style. It has a real groove and shimmer to it. It may take some believing, but “Amethyst” has a sound that is like Oasis brought up on LA Metal rather than Manchester indie. Maybe it’s just because there is a Beatles influence in there, indeed, “White Lightening” could be Enuff Z’Nuff at their darkest (i.e. Tweaked era). Then “Blue Eyes” is just a wonderful summer pop song and “Bleed Out” is a great pop/rocker built for playing loud. Not surprisingly, there is a darker side to the album, as shown on “Youth Quake” and “Parachute” which are maybe closer to the Stone Temple Pilot’s sound. However, we also get the pure pop of “Beach Pop” which is a real, does what is says in the title type song! In many ways, the cover of “20th Century Boy” isn’t really necessary as the influence of Mr Bolan is already all over this album. Having mentioned Mr Weiland’s past and reputation, it may have been worthwhile this being released under a new band name so it didn’t have any baggage to carry. As a standalone piece of work, it is an absolutely fantastic pop/rock album. It is full of great tracks that will be the perfect accompaniment to a hot summer’s day.